ALVIN J. FELLOWS, OF NEW HAVEN, CONNECTICUT. Letters Patent No. 79,965, dated July 14, 1868. The Schedule referred to in these Letters Patent and making part of the same. Figure 1 is an enlarged perspective view of the apparatus as it will appear when ready for use. Figure 2 is a plan of the same, with the movable side taken off, showing the internal structure of the apparatus. 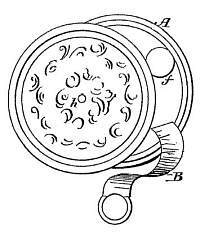 My improvement consists in the manner of fitting the spring-click which detains the main or primary spring to the central part of the main-spring barrel, so as to hold the tape at any desired position. I make the case, A, fig. 1, and A A, fig. 2, of gum-lac and saw-dust, or any other analogous substances, and color it with ivory-black, or any other suitable matter, to suit the taste or market. I fit the spiral or helical springs, to wind up the tape, in the usual way, as indicated in several sections at a a, &c., by securing it in a suitable sheet-metal barrel, as shown at b, and attaching its inner end to the arbor or stud h, and its outer end to the periphery or rim of the barrel, as is done in watches, &c., as indicated in fig. 2. On this stud or arbor h, and outside of the head b of the main-spring barrel, I fit a piece of sheet metal as b', in such a position that its outer end will rest in the periphery of the case, as shown at c, fig. 2. To this plate or piece I attach the spring-click, as shown at d d', in such a manner that the working end d' will hook over the edge of the arm c, of the knob f, in such a manner that the click, acting against the projection g g, &c., on the barrel, will prevent the recoil of the mainspring, and hold the tape at any desired position, and let it back at pleasure. Having made and arranged the parts as before described, I wind on the tape, B, as represented at B', fig. 2, put on the plate b' c with the click-spring d and d', and the arm e, with its knob f, when the whole will appear as represented in fig. 2; I then screw the movable cap or side of the case on to the arbor h, when the whole will appear represented in fig. 1. 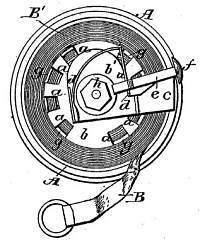 The combination of the case A with the plate b', click-spring d d', and the arm e, and knob f, when the whole is constructed, arranged, and fitted for use, substantially as herein described.